[Solved] what is libdvdcss? How to download and install libdvdcss on Windows for accessing and unscrambling css-protected DVDs? "I just got word that Handbrake could rip copy-protected DVDs with libdvdcss. So, what is libdvdcss? How can I download libdvdcss for my Windows computer for further use?" According to the statements in Handbrake official site, HandBrake is unable to process encrypted DVDs alone. If libdvdcss installed, HandBrake possibly makes it. However, its developers have removed this useful yet controversial thing from this open source video transcoder for several years. Currently, HandBrake users can remove DVD copy protection after downloading the latest version of libdvdcss for Windows or other operating systems or installing VLC which includes the libdvdcss library natively. Although with libdvdcss installed on Windows, HandBrake still has trouble in DVD ripping in most cases. Then, you might as well try an alternative - WinX DVD Ripper Platinum. It is available to rip any DVD (not limited to CSS-protected discs) to MP4, MOV, AVI, WMV, MPEG, iPhone, iPad, Android, Windows Phone, or others on Windows 10 and lower. libdvdcss (aka. libdvdcss2) is a free and open source software library developed by VideoLAN. It is used to access and decrypt DVDs encrypted with Content-Scrambling System (CSS) on Windows, Mac OS X, GNU/Linux, BeOS, BSD and Solaris. In December 2015, libdvdcss was updated to version 1.4.0, ending the support for Windows 9x and Windows NT 4.0, HP-UX and BeOS. Is It Legal to Use libdvdcss on Windows and Other Systems for Decrypting DVDs? Due to the ability of removing DRM, some people wonder if it is legal. Using libdvdcss to decrypt DVD is authorized by a French law decision CE 10e et 9e sous­sect., 16 juillet 2008, n° 301843 on interoperability, and allowed in the USA in some cases. You can download libdvdcss on Windows 10, 8.1, 8, 7, XP from videolan.org. Copy and paste http://download.videolan.org/pub/videolan/libdvdcss/ to your browser. And then you'll see a list of libdvdcss versions displayed. Find the one you need and begin downloading libdvdcss for Windows. 2. Download proper libdvdcss file based on your operating system. If you possess a Windows 32bit computer, just hit win32/ and then click libdvdcss-2.dll to begin downloading. If you work on a Windows 64bit PC, then you're supposed to hit win64/ and then download this libdvdcss-2.dll for Windows. libdvdcss alone can't perform DVD encryption and playback. It needs to unite with DVD ripper and player. But how? This could be a difficult task for non-tech savvy guys. Thus, we explain more as below. How to Install libdvdcss for HandBrake on Windows? Step 1. Follow the tutorial above to download libdvdcss into your Windows computer. Note: Not to bother renaming libdvdcss-2.dll to libdvdcss.dll. That's all. Now you just need to open HandBrake and decode encrypted DVDs just like you do on unprotected DVDs. Or, you can follow the step-by-step guide below to make a digital copy. How to Rip Copy-protected DVDs with HandBrake after VLC libdvdcss Is Installed on Windows? To begin with, insert target DVD into your computer DVD-ROM drive. And then, follow steps below. Step 1. Launch HandBrake, click Source, and then you'll see the DVD you just inserted. 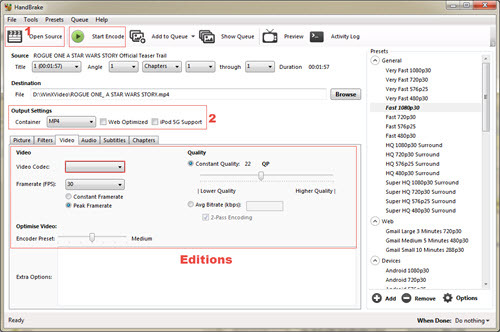 Click it and then HandBrake will begin scanning titles and select main title for you. Alternatively, you can opt for target item as you like. Step 2. Hit Browse under Destination to define a folder to store the copy and write down a file name. Next, navigate to Output Settings, choose a container (MP4 or MKV) or select a preset from the right column, and adjust more settings as you like. Step 3. Click on the green Start button to begin ripping copy-protected DVD by making use of HandBrake and VLC libdvdcss on Windows. For more detailed guide, you can jump to "How to Free Rip DVD with VLC libdvdcss and HandBrake Faster and Simpler"
What if HandBrake Can't Rip DVDs even with VLC libdvdcss Installed on Windows? "I've just purchased the TV show mentalist series and am trying to back up the disks to MKV files. It doesn't work. I'm getting no video and garbled audio. I've tried both the 32 and 64 bit versions of 0.10 and the latest nightly builds. I've downloaded several copies of libdvdcss-2.dll. If I leave the filename as libdvdcss-2.dll (as suggested on some forums posts) it crashes HandBrake when adding to the queue. If I rename it to libdvdcss.dll I can add the job and run the rip, but as I said, the output is useless. The results are the same for 32 and 64 bit rips. I'm getting this error 'Device A:\ inaccessible, CSS authentication not available.' even with libdvdcss"
After ransacking communities and related tutorials online, we still can't fix this Windows libdvdcss error. And downloading a professional DVD ripper is highly recommended as the best workaround. 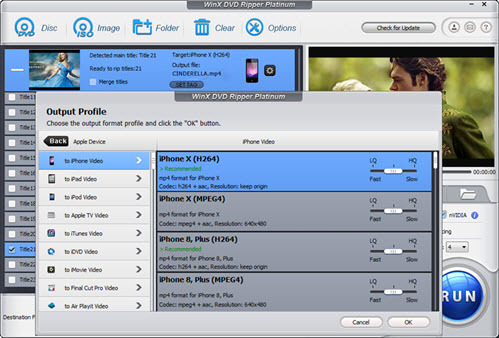 Among all the DVD rippers for Windows in the market, WinX DVD Ripper Platinum is worth a try. 1. No VLC libdvdcss or other things required. 2. It can rip DVDs encrypted with CSS, region code, RCE, Sony ArccOS, UOPs, Disney X-project DRM and more by itself. 3. In addition to ripping DVD to MP4, it is available to convert DVD to AVI, WMV, MOV, MPEG, FLV, MP3 and other multimedia formats. 4. With hundreds of premade output presets, it helps rip DVD to Apple (iPhone, iPad, iPod, Apple TV, iTunes), Android (Nexus, Samsung, HTC, Kindle Fire), Microsoft (Windows Phone, Surface, Xbox), Chromecast, Sony, Nokia, etc, with ease. Have difficulty in ripping DVD with HandBrake and VLC libdvdcss on Windows? Free download WinX DVD Ripper Platinum to make DVD copy easily, quickly and flawlessly. Can libdvdcss Help Rip All DVDs on macOS Sierra along with HandBrake?